All new clocks will be delivered free of charge to any mainland address in the United Kingdom (some exclusions apply - see below for deltails). If a clock is in stock it can usually be delivered within 2-3 days. However, as many of the clocks are made to order or will be made to specific customer requirements, delivery can take longer. In all circumstances we will endeavour to keep you up to date with estimated delivery times and order processing. For complete piece of mind, all Comitti Longcase clocks will be delivered and set-up free of charge by a trained technician in any UK mainland address. You will also be given full information on how to maintain and operate your clock. Free Delivery Exclusions - Due to the size and weight of certain weight driven Hermle & Kieninger wall and Longcase clocks these cannot be shipped using a normal courier. They will be specially packed and shipped to you using a specialist shipping company. Individual shipping costs will be calculated at the time of ordering. 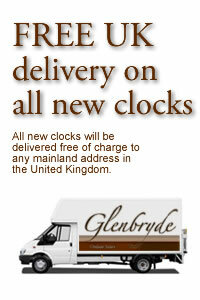 *All antique clocks (excluding longcase clocks) will be delivered within the UK, by insured courier at a cost of £25. Antique Longcase clocks will be delivered within the UK, by ourselves (depending on location) or by an insured courier at a cost of £100. For international shipping please email us for a quotation.